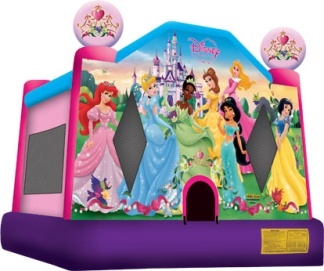 The beauty of Disney’s 7 Princess featuring Ariel, Cinderella, Tiana, Belle, Jasmine, Aurora and Snow White is a sure draw with this fun licensed Disney’s 7 Princess jump, a bouncy house with a bit of nobility. Participants are welcomed by Ariel, Cinderella, Tiana, Belle, Jasmine, Aurora and Snow White, all ready for the ball. Visitors will rule this bouncy house kingdom, with plenty of room for bouncing fun all day long. This Disney’s 7 Princess bouncy house features a pair of 3-D princess toppers, along with beautiful artwork fitting for royalty. Children love to be with there favorite friends. This compact smaller sized inflatable bounce house can fit even in smaller yards. Kids can jump away the day with all their friends. After all, Busy Kids Make Great Parties!